If you want to see a play by one of the twentieth century's playwriting greats staged with a completely new interpretation, I suggest you head to the Belasco for Sam Gold's revisionist take on Tennessee Williams' Glass Menagerie. The frequency with which some twentieth century classics are produced makes them so familiar that theatergoers tend to be open to fresh takes. Thus they embraced Ivo van Hove's decidedly non-traditionalist versions of Arthur Miller's View from the Bridge and The Crucible. Since Miller's The Price is less well-known and regularly produced plays, it's not too soon to see it revived in its more traditional format, as is the case with the revival now at the Roundabout's American Airlines Theater. Obviously, most theatergoers nowadays are too young to have been personally affected by the Great Depression of the early '30s, as Miller himself and The Price's brothers Victor and Walter Frantz were. Yet, with its focus on familial relationships this somber and depressing slice of life is an upbeat experience in that it offers us a well-staged example of a realistic drama posing ever valid moral issues. If anything, the secrets, regrets and choices of this family drama have a more universal hit-home appeal than ever. In typical Roundabout fashion this revival features a seasoned cast. While lacking the poetry of Miller's masterwork, Death of a Salesman, Terry Kinney does bring it off as a fine theatrical string quartet. His players hit the right keys to reach the big climax this sort of well-made play calls for. The story takes place in 1968 in the attic apartment of the Manhattan town house in which Victor and Walter Franz (Mark Ruffalo and Tony Shalhoub) grew up — before their father went broke in the '29 stock market collapse and lived as an impoverished tenant in the attic. As indicated by the water towers outside Derek McLane's cluttered interior, the once upscale neighborhood is changing. The furnishings of the long unoccupied apartment must be disposed of before the building is torn down. And so, the changing real estate landscape serves as the device to bring the long estranged Franz brothers together. Obviously, there's going to be a lot more to be disposed of besides the furniture and memorabilia. The brothers have been living in different worlds for many years, one a police sergeant, the other a wealthy surgeon. The demolition of the house in which the seeds of their estrangement were planted seems to concern Victor more than Walter. Since they are co-owners of any money yielded from a sale Victor, having failed to reach Walter, has taken matters into his own hands. When the play's opens we find him and his wife Esther (Jessica Hecht) waiting for an antiques dealer. Their opening duet establishes that their loving relationship has been rocked by her escalating discontent with her lack of status and money as a cop's wife. Finding the cluttered attic and its history depressing Esther leaves to go on an errand, which paves the way for another duet. This one brings on the character who provides some much needed comic relief, the 89-year-old Gregory Solomon (Danny DeVito). But just as Victor has agreed to the price offered by the wily old appraiser, Walter shows up and the brothers are face to face for the first time since their father's death sixteen years ago. The appraiser continues to be a sporadic presence for the rest of the play. If he gets to complete the deal, it won't be easy for him to deal with the physical remains of the Franz family's lives, but neither will the Franz brothers find easy solutions during this long overdue airing of their resentments and misunderstandings. The title is not just about the figure haggled over and agreed upon for the apartment's contents. It's also Miller's way of summing up a metaphoric fact of life: Whatever you do, whatever trade-offs you make, there is always a "price." Victor sacrificed a promising career in science to support his father. Walter, seeing the father as more selfish than needy, went his own way— and later, wanting his brother to see through the illusion of the father's neediness, refused Victor's plea for a modest loan, causing the final rift in an already fragile sibling relationship. The brothers' divergent views about roads taken also parallels reflections on the value of the furnishings about to be sold. Victor just wants to be rid of these reminders of too many years of putting aside his own ambitions to support the broken man his father became. His wife sees that furniture as a window of opportunity to turn years of doing without into a last chance to have a more meaningful life— translation: more financial comforts, more prestige than being the wife of a cop. Walter views the neglected old homestead and everything in it as a symbol of the family's neglect of nurturing loving relationships instead of a love of money and success. Not to be overlooked as just a comic leitmotif there's the crusty old dealer for whom this estate represents a final chance to be a contender. Until Victor picked his name out of an outdated telephone directory his business has been past history. Unlike Victor, who at fifty-four is resigned to life in the slow and unadventurous lane, Solomon, a one-time acrobat, is Miller's Dionysian creation — a man who has not let personal tragedies destroy his zest for life and willingness take risks (another marriage at seventy-five and taking hold of this chance to come out of retirement). Terry Kinney has given The Price a solid production without any attempts to intersperse trendy "now" touches. While Mark Ruffalo's Victor is a bit too stiff as the play's most conflicted character, he does well with the wordless moments when we see him wander around the room, winding up an old victrola, twirling a fencing sword as he did in his youth. He does achieve emotional momentum in his final brutal confrontation with Walter. Tony Shalhoub, who last won well-deserved kudos as the droll leader of an Egyptian band ( The Band's Visit), is on the mark as the brother whose success has come at the price of a satisfying personal life. In fact, the play seems to first get into full gear with his unanticipated arrival. Jessica Hecht is. . . well Jessica Hecht. No matter what a role calls for (even singing, as in the recent revival of Fiddler On the Roof ), she handles it with style. There's no missing Esther's frustration with Victor and yet there's no question that she loves him. 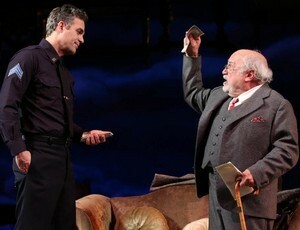 As for the appraiser, Danny DeVito is an inspired choice. He's hilarious but doesn't let the shtick overwhelm the aptly named Solomon's wise and witty observations: for example, when assuring Victor that he is indeed a licensed appraiser, he declares "The only thing you can do today without a license is you'll go up the elevator and jump out the window." His comments on the diminished value of some of the furnishings are priceless; for example, a sturdy table is not likely to do well "in a world where people like things disposable so that they can indulge their passion for shopping." He does acknowledge, however, that "when a man sits down at such a table, he not only knows he is married; he is staying married. People won't go shopping with this kind of furniture. Solomon's pithy wit and wisdom eases us into the brutal Victor-Walter clashes and retains its spark. And, while there's a case to be made for new-fangled, bare bones presentations, The Price simply wouldn't be The Price without that roomful of memory stirring furniture. From 2/16/17; opening 3/16/17; closing 5/07/17. Saturday and Sunday matinees at 2:00PM.